Supports hot reloading of Angel servers on file changes. This is faster and more reliable than merely reactively restarting a Process. This package only works with the Angel framework. This package is dependent on the Dart VM service, so you must run Dart with the --observe (or --enable-vm-service) argument!!! Usage is fairly simple. Pass a function that creates an Angel server, along with a collection of paths to watch, to the HotReloader constructor. The rest is history!!! The recommended pattern is to only use hot-reloading in your application entry point. Create your Angel instance within a separate function, conventionally named createServer. Using this in production mode is not recommended, unless you are specifically intending for a "hot code push" in production..
// Edit this line, and then refresh the page in your browser! Forcibly close app loggers on shutdown. Remove stutter on hotkey press. Fixed for compatibility with package:angel_websocket@^2.0.0-alpha.5. Update for Dart 2 + Angel 2. Fix a bug that threw when --observe was not present. Disable the observatory from pausing the isolate on exceptions, because Angel already handles all exceptions by itself. 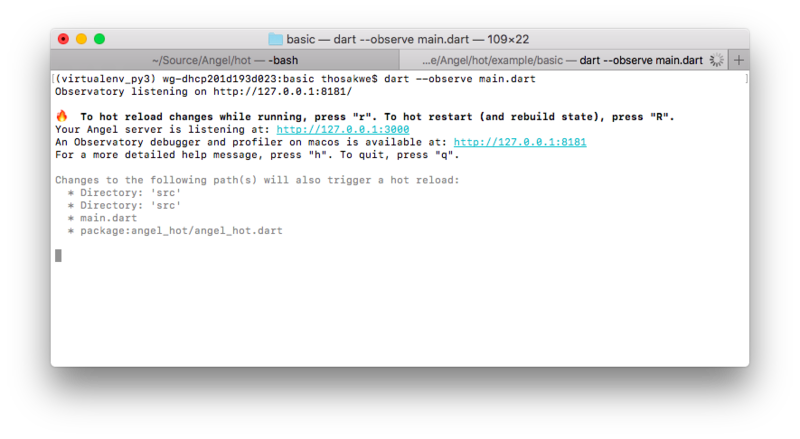 Primary library: package:angel_hot/angel_hot.dart with components: io, isolate, mirrors. line 67 col 25: Use = to separate a named parameter from its default value. line 68 col 25: Use = to separate a named parameter from its default value. line 74 col 5: Future results in async function bodies must be awaited or marked unawaited using package:pedantic. line 164 col 12: Use isNotEmpty for Iterables and Maps.